This complete set offers the performance women want for their game and an eye-catching look that suits their style. With a 460 cc driver, fairway wood, two hybrids, six irons and a putter, the Strata Plus Women’s Set provides the distance and versatility that female golfers love. The XVII Complete Set is a great starter set, or perfect for lady golfers who are looking for a value. With a 12.5 degree driver and alloy fairway wood, 4/5 hybrid iron, low COG 6-9 cavity-backed oversized irons, a pitching wedge and a perimeter weighted putter with a precision face, this set comes packaged with everything you’d need to play a successful round of golf! The driver features a premium graphite shaft with steel shafts on the fairway, hybrid, irons and putter. The putter features high alignment visibility marks for simplified and successful strokes on the green. The driver, fairway wood and hybrid irons come equipped with matching head covers. A matching purple and black cart bag is included in this set and features a 6 way graphite safe compartment top. With tons of storage space, this XVII bag features a large garment pocket, multiple accessory pockets, an ample golf ball pocket and an easy access pocket perfect for your miscellaneous golf items. An umbrella holder and carry handle make this stand bag extremely efficient as well as good looking! This stylish set is designed specifically for female golfers who want to maximize their distance and performance. With a 460 cc driver, fairway wood, hybrid, three irons and a putter, the Strata Women’s Set offers more forgiveness to help women hit long, accurate shots. Play the game while supporting breast cancer research with one of Wilson’s top Hope products. With the purchase of the Hope Golf Set, Wilson makes a donation to the Breast Cancer Research Foundation (BCRF). This set is stylish and designed specifically for women players. Lightweight and easy to play with, these clubs are truly winners. Hit the links with quality style with this Wilson Ultra Golf Set for women. This Wilson Ultra golf set includes matching head covers, driver, fairway wood, #4 hybrid, (5-PW) irons, putter and a shoulder strap. This set has everything you’ll need to take your game to the next level. The Wilson Ultra Golf Set includes a large, sweet-spot driver that will provide plenty of distance off the tee, and the #4 hybrid eliminates the hassle of hitting long irons, and the putter includes a steel shaft that produces consistent contact and feel, so you can finish the hole with confidence!Improve your golf game with the Wilson Ultra women’s golf set, which includes all the clubs you need to hit the course with confidence. The right-handed set starts with a 460cc graphite driver with a low center of gravity (CG), helping produce better distance and accuracy with every shot. The set’s fairway wood is similarly built, with a graphite shaft for added strength. Golfers with control issues will love the wood-style hybrid, which replaces your long irons to improve your game from the rough and fairway. The hybrid includes a True Temper steel shaft. And the set’s six short irons are designed specifically for forgiveness. Each iron includes a deep undercut cavity with low and back weighting, helping the ball get airborne with length and accuracy. The undercut cavity also expands the sweet spot by positioning the weight directly behind the hitting area. The set concludes with a high moment-of-inertia (MOI) winged putter and a saddle-bag-style stand bag with a padded double strap and multiple pockets. 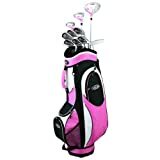 Ladies Complete Package Set With 12 Clubs & a Bag. With industry-leading and breakthrough advancements in the new Speedline Tech Driver. You’ll swing it faster, easier and with more confidence than ever before. 460cc titanium driver with 12° loft for added forgiveness, fitted with steel shaft, complete with headcover. 24 degree hybrid iron with a steel shaft, replaces the difficult to hit longer irons. 6-7-8-9-PW easy to hit cavity back irons with steel shafts. Putter fitted with steel shaft. Upgraded stand bag with auto pop legs, plenty of external storage and raincover included as standard. : Looking to take up the game of golf but don’t want to break the bank on clubs? Turn to the Confidence Power women’s hybrid club set, which includes everything you need to hit the links with confidence. The set’s long clubs include an oversized metal wood and an easy-to-hit 24-degree hybrid wood. The oversized wood offers a bigger sweet spot than standard woods, while the hybrid replaces the difficult-to-hit longer irons without sacrificing an ounce of performance. For the mid-range to short approach shots, you can pull out one of the cavity-backed irons, which are built to offer more forgiveness. The set includes 6-, 7-, 8-, and 9-irons, along with a pitching wedge. And beginning golfers can make short work of the greens thanks to the hybrid semi-mallet putter. All the clubs are fitted with regular-flex steel shafts. The set concludes with a stand bag with all-weather grips, auto-pop legs, plenty of external storage, and a rain cover. 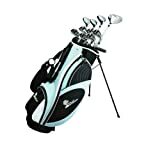 Set comprises of: 2 woods (Driver and 3 wood), 2 hybrids (18° and 21°) 6 irons (5-PW), blade style putter with a deluxe stand bag and matching headcovers. All clubs -1″ from lady’s standard length. 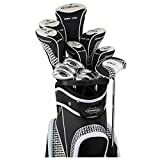 Set comprises of: 2 woods (Driver and 3 wood), 2 hybrids (18° and 21°) 6 irons (5-PW), blade style putter with a deluxe stand bag and matching headcovers. All clubs -1″ from lady’s standard length. Titanium Matrix driver with an oversized 460cc head and a 12.5° loft and a 15° 3 wood. Hybrids (18° and 21°): These easy to hit clubs are designed to replace the difficult to play 3 and 4 irons. Exclusive to Golf Outlets of America Inc, the latest set from Golf Girl. Features: 460cc oversized driver with graphite shaft and the biggest sweetspot legally allowed. Oversized 3 wood with graphite shaft. 3/4 hybrid with graphite shaft great for long approach shots or getting out of trouble. Zippered headcovers for driver, wood and hybrid. 5-6-7-8-9-PW deep cavity back irons with graphite shafts are easy to hit and more forgiving than previous models. Putter. Deluxe cart bag featuring plenty of external pockets including valuables pocket and full length clothing pocket.Exclusive to Golf Outlets of America Inc, the latest set from Golf Girl. Features: 460cc oversized driver with graphite shaft and the biggest sweetspot legally allowed. Oversized 3 wood with graphite shaft. 3/4 hybrid with graphite shaft great for long approach shots or getting out of trouble. Zippered headcovers for driver, wood and hybrid. 5-6-7-8-9-PW deep cavity back irons with graphite shafts are easy to hit and more forgiving than previous models. Putter. Deluxe cart bag featuring plenty of external pockets including valuables pocket and full length clothing pocket. 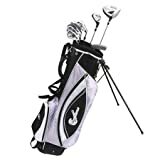 Find more Ladies Golf Club Sets products on Amazon!